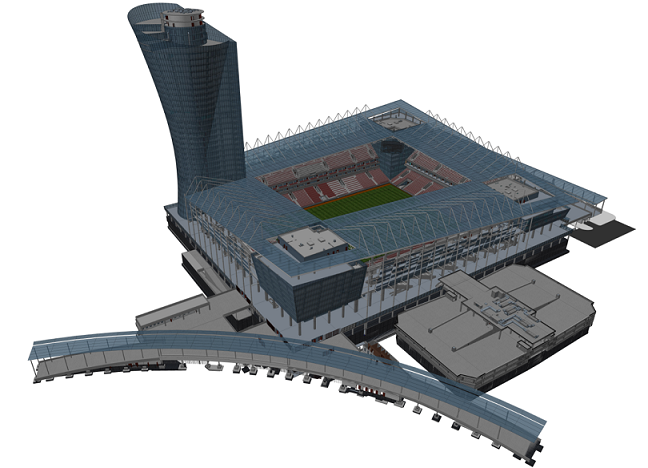 The new stadium for one of the largest and most successful football clubs in Russia, CSKA Moscow. The stadium has a capacity of 30.000 people, and the integral part of it is a skyscraper aimed to resemble the UEFA Cup, first European trophy won by a Russian club with CSKA beating Sporting CP in 2005. The 142-meter-tall skyscraper stands in the south-west corner, and the remaining three corners also have office spaces and skyboxes instead of regular stands. The project includes the 1.400 car park spaces, and the total project area exceeds 175.000 m². Building Information Modelling was introduced by the design-build general contractor, at the beginning of the detailed design and has been implemented during the entire construction phase. The BIM model of approximately 400.000 BIM elements has been developed at LOD300 of and has been kept up-to-date during entire project execution. Considering the complexity of the project, clash detection and design coordination process was very beneficial, identifying and resolving more than 3.200 of actual major spatial conflicts and discrepancies among design disciplines (more than 20.000 minor conflicts were identified using BEXEL Manager), saving approximately 4 months of construction time, and prevented the estimated loss of 3 million USD. The coordination process has been carried out through regular weekly meetings with the design team and took one to five iterations of clash detection to reach the coordinated design in different project areas. Based on the coordinated BIM model, the correct builders work drawings were extracted saving significant costs and effort, especially important for the tower building where the high concrete class was used and any drilling works would be very costly and would waste a lot of time and effort. In total, the Contractor benefits from BIM Quantity Takeoffs with direct savings of 3.17% of the total contracted value. 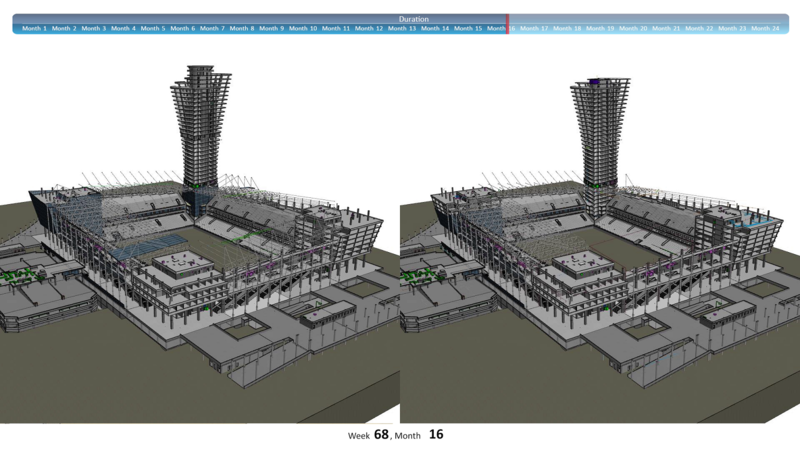 From the earliest phases of construction planning, using BEXEL Manager, 4D/5D simulations were developed and construction schedules analyzed to confirm that no works have been omitted from the schedules. 4D BIM model was also used to provide planners with precise quantities related to every scheduled task, significantly improving the quality of the construction schedule. Linking the agreed unit prices 5D estimations such as cash flows were developed and construction schedule adjusted accordingly. 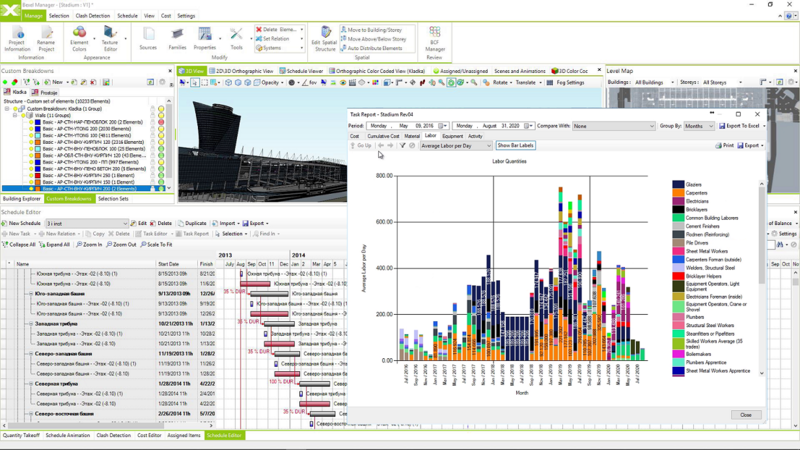 Due to various unpredictable market changes which appeared during project execution, 4D/5D simulation has been updated eight times by inputting costs changes and the actual construction progress, in order to provide contractor’s management with valid information on the current progress and value earned, as well as estimating the planned costs for the following period. Regular executive reports with planned vs actual analyses were created, enabling contractor’s management to keep track of the project execution, react to market changes, and successfully finalize this rather complex landmark construction project.